Not much to report yet, just got in. The flight was 13 hours - had two+ meals, did some reading, took some catnaps. Overall the time went fairly quickly. 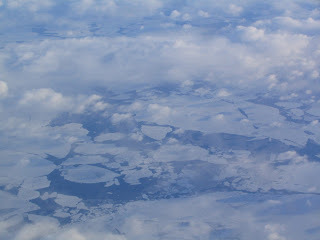 Attached is a picture I took out the window as we flew directly south of Siberia (I'm not sure which body of water/ice that is). Made a friend at the airport - some lady from San Francisco who for some reason kept asking me for advice about picking up luggage, customs, how much money to get at the ATM, how to find a ride, etc. The ride from the airport to the hotel took almost an hour. When we got off the highway, I could swear we were in St Petersburg based on the architecture and weather. But that quickly changed as we entered downtown - it looks more like Times Square. Here's a random view out the window of my hotel. 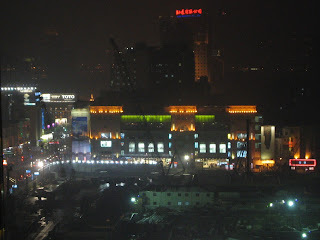 I had stayed up all night finishing things and packing before flying out, so as a result I seem to be completely adjusted to the Shanghai time zone. The weather is much better than I had heard it would be (no snow right now). Stay tuned.